Today I’m going way off topic. No tech news, no spyware tips, just a good news story. If you’re a regular Bits from Bill reader this might give you a good idea of what makes me tick. On Saturday, in a college softball game in Ellensburg, WA spectators experienced a once in a lifetime display of sportsmanship. Senior Sara Tocholsky hit a three run homer for her Western Oregon team propelling them into the lead. 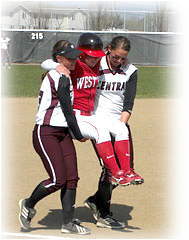 Unfortunately while reaching for first base, her knee buckled and she fell to the ground in pain. Umpires were quick to point out that unless Sara continued around the bases her run would not count. In addition, she could not receive help from any of her teammates. Enter Central Washington first baseman, Mallory Holtman. She asked officials if it would be ok if her and her teammates could carry Sara around the diamond allowing her to touch each base. That’s what they did. Holtman along with shortstop Liz Wallace carried Tocholsky around and lowered her to each base allowing her to complete her first home run and score the winning run. Few people know that my all-time favorite sport is Little League Baseball. Every year in August I look forward to the Little League World Series from Williamsport which has been broadcast in HD for years. There’s nothing like the raw emotions of the kids who compete in these games. I used to work for a joint venture of ABC Sports and games company MicroProse. Every year I’d propose we do a Little League World Series video game but it never happen. My old buddy Doug Whatley recently Emailed to tell me Activision was finally going to do it. So I guess I have a little tech news for you. Watch for Little League World Series 2008 to be released on Aug 5th for the Nintendo Wii. When I was growing up they didn’t have a rule that said all kids got to play. I still learned and appreciated what true sportsmanship is all about. My admiration goes out to the girls of Central Washington and their coach Gary Fredrick. No matter what the score, they’re big winners. That is a great story of true sportsmanship. It not only shows compassion for Sara but also great team play even if they are the other team! I consider both teams winners in this game. The "team spirit" shown here would be a great example to our nation's leaders! If we could only get our political leaders to act like these kids, our country would not be in the state it is today.